Having a fire extinguisher in your home, on your boat, at the office, really anywhere fire puts human life in jeopardy can mean the difference between catastrophe averted, or a tragedy. Keeping that in mind, it is equally important they be carefully and safely stored to make sure they remain in full working order. Below are some considerations for keeping your fire extinguisher(s) stored properly. A fire extinguisher is one of those things where you kind of have to throw style and theme to the wind. Just because it clashes with the motif of your kitchen, does not mean that you should keep it tucked behind a door, or in a pantry. It needs to be readily accessible at all times. Having it hidden can cost you valuable time if and when a fire needs to be dealt with. This is especially true if people who are not familiar with your home are staying over and need quick access to the fire extinguisher. You don’t want them spending time looking for it while your home burns down. This is a good height to keep a fire extinguisher because it is high enough off the ground that toddlers and infants are unable to grab hold of it, and low enough that older children are still able to reach for it if they need to take quick action. 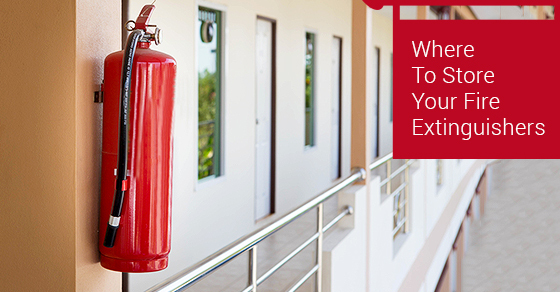 If you have a fire extinguisher in your home, or multiple fire extinguishers, it is a good idea to make sure that everyone (especially kids) knows what it is for, and when it is to be used. It is recommended that you keep your fire extinguisher in the kitchen, or if not, as close to the kitchen as possible. It goes without saying that this is the most likely place in your home for a fire to break out, so having quick access is key. This means having it on a wall away from the oven or stove. Since these two appliances are the most likely cause of fire, having the extinguisher too close to them could mean that you are unable to access it without burning yourself in the event of a fire. Another recommended storage area for a fire extinguisher is in the garage where flammable liquids, as well as electronics, can create environments where fires are likely to start. A fire extinguisher is a life saving device and should be treated as such. They should be well maintained, checked regularly for expiration dates, and above all, stored properly to ensure that they are ready to be used if and when a fire strikes. Keep the above fire extinguisher storage considerations in mind and ensure that you always have access to a fully functional fire extinguisher.